CIRM Wants to Turn Stem Cells Into Cures - Faster! The California Institute for Regenerative Medicine (CIRM), has completely overhauled its process for funding projects to develop stem cell-based treatments and therapies. Beginning January 1, CIRM, which is California's voter-supported, grant- and loan-making agency funding stem cell research, will launch CIRM 2.0 which will shorten the time from application to funding from nearly two years to 120 days. This is a really big deal: a 10-year-old government funded agency has completely upended the only thing with which it is charged in the interest of fulfilling its mission to accelerate stem cell treatments to patients with unmet medical needs. Risky? Of course. But the potential payoff is tremendous: cures and treatments where none exist for serious and even deadly diseases. Under the current process, the agency only receives applications a few times a year, and sporadically at that. Under CIRM 2.0, the institute will take applications on a continuous basis with monthly reviews. The speedier cycle makes it more likely that the agency will fund more projects from industry than it does now. Today, most funding goes to academia -- 91% according to CIRM. The previously extended application and funding cycle tended to make CIRM an unrealistic -- and expensive -- source for non-academic projects as the wait time from application to funding averaged 22 months. That's a long time. Particularly when lives on the line. Dr. C. Randall Mills, president and CEO of CIRM describes that 22-month cycle in terms of his previous job as CEO and president of Osiris Therapeutics which researches therapies for deadly diseases including pediatric steroid refractory acute graft-versus-host disease: "...[T]wenty-two months equates to about 700 dead children." 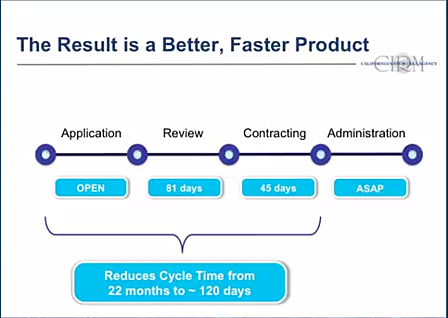 The rolling application cycle also means that companies don't have to submit applications for funding before they're ready. Pre- CIRM 2.0, researchers studying stem cells needed to get their applications in to CIRM whether or not their work was ready. Research teams crossed their fingers and hoped that they were close enough to, for instance, the clinical trials phase, to get their work funded. If not, then a mediocre application would be rejected after a lengthy review process. Of course, the team could submit a revised application, not until CIRM called for applications again, which could be more than 18 months in the future. Image from the California Institute for Regenerative Medicine (CIRM).